Thanksgiving Day is typically filled with great food, family and friends. Many families practise the tradition of going around the table so that each person can tell others what they are grateful for through the year. For those who never think about “gratefulness,” this can be intimidating. The truth is every day should be Thanksgiving, all the days before, the days after, and every day in between. Is this year any different than other years? Well, maybe. Let’s take a look at why you and all who do senior care in Toronto should create a gratitude list this Thanksgiving. If you are paying attention even a little, you will have noticed that there have been multiple natural disasters of late—thousands of people have lost everything. Many have lost their homes, all their possessions and even members of their family. Hundred of residents of Houston, Texas, had only the shoes left on their feet after record flooding. People in Puerto Rico are still suffering without adequate drinking water or electricity. Consider all the things you take for granted. If you have food on the table, a roof over your head, and loved ones around, you are indeed blessed. It’s easy to focus on the all the negative issues in life. This could be called “Poor Me Syndrome.” Keeping a list of what you are grateful for will gradually change your attitude and those of the people around you. Instead of focusing on the rainy weather causing you to be late, be grateful you have a car and you got from point A to point B safely. Instead of focusing on how senior care in Toronto can be frustrating and thankless, think about the smile on your parent’s face when they first see you. Sometimes that’s all the thanks you need. Give up those “woe is me” thoughts and pay attention to every little positive thing that occurred during the day, no matter how small. Then write them down each night. Keeping a gratitude list and adding to it on a daily basis forces you to pay attention to the good things in your life. It can keep you healthy both physically and emotionally. Don’t forget to read it both to yourself and to your senior loved one. It’s true. The more you are grateful, the more you will attract good things and good people into your life. That contagious phenomena acts like a gift you give to others and vice versa. Surrounding yourself with grateful people will rub off on you. 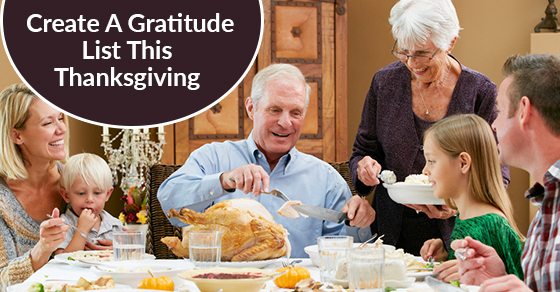 Don’t forget to share this gift of gratefulness as you engage in senior care in Toronto. Pick up a copy of Simple Abundance by Sarah Ban Breathnach to help you get started on a grateful life.